While we’re on the topic of finding treasures in unexpected places, I feel like I need make a mention of Old Navy. Their Rockstar jeans are a definite favourite (so comfortable), and they’re responsible for a large portion of my “cozy” wardrobe. As part of the launch of their new flagship store on Robson Street last week, I joined my girls Alex and Alicia and took part in a little style off where we put together winter-themed looks according to personalized themes (all for under $200, no less). I was given the task of creating a “snow day” outfit, and knew that it had to be built around this fun Nordic print sweater. Check out all of our looks and let me know which one you like most! We’ll be posting them on instagram later today, and the whoever gets the most votes will choose a random “liker” to receive a $100 Old Navy gift card! Gotta love Old Navy – they definitely come in clutch often! I think you hit the nail on the head with your “snow day” look!! 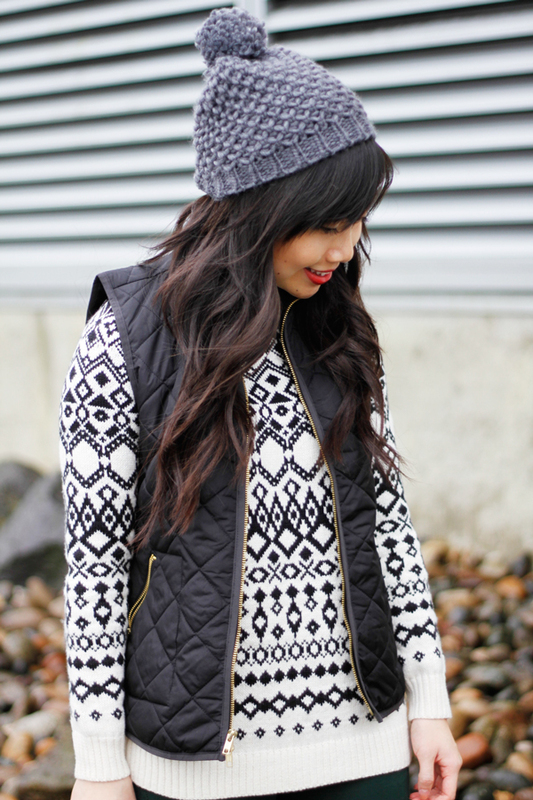 The quilted vest is my favourite piece, but that pompom hat is a close second!! Love the comfy look! Just my style! Your outfit is by far my favourite out of the three! The print of the sweater along with the vest, toque and gloves is perfect for a snow day, and the forest green shade of your jeans adds a nice splash of colour. Such a cute sweater! I really love how comfortable yet stylish this look is. It really seems like something you could wear all day. Of the 3 your outfit is the best Jen! 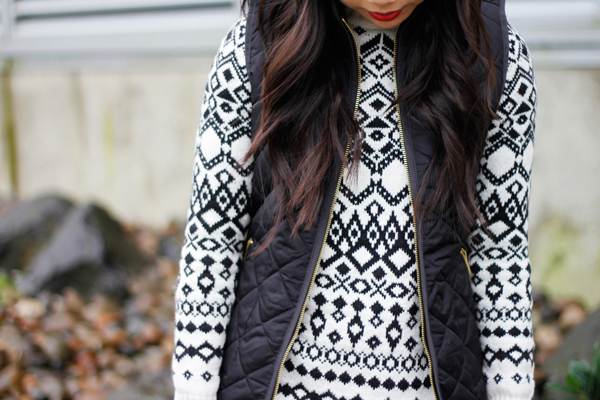 Love the pieces you picked … perfect for Vancouver weather!